Now THIS is comfort food! This Creamy Chicken and Rice Casserole is one of our family’s all time favorites. It is packed with hearty chicken, in a creamy sauce with tender rice, and a perfectly crispy cracker crust. This is a pretty big statement, but I am going to put it out there. This might just be my husband’s favorite dish that I make. I will admit it and tell you I was a skeptic about this recipe at first. I mean it doesn’t have any spices in it. No garlic, no onion, not even any salt and pepper people. I was absolutely certain that this would not be very good. 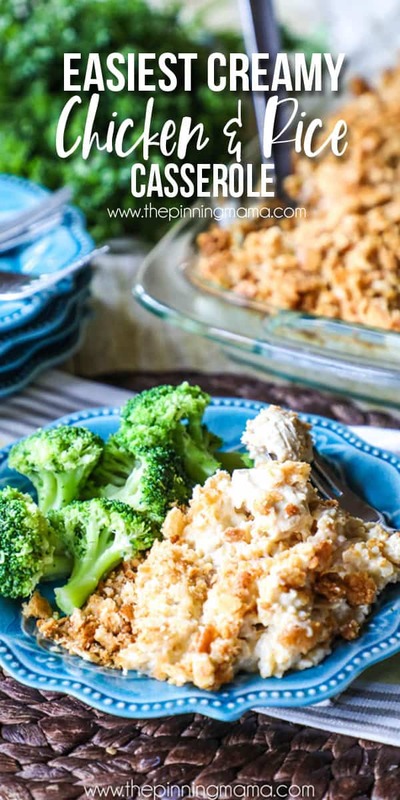 This dinner is the epitome of comfort food and has become one of our go to recipes throughout the years and inspired me to make many more recipes like it! It is simple and easy to make, and I think that is just what makes it so good. The creamy chicken flavor is amazing. It doesn’t need anything to cover up, hide or even enhance it. It shines all on it’s own and I sure am glad I gave it a chance to the first time I made this dish! I got the recipe from my friend Charlotte back when we lived in South Carolina. She was a wonderful homemaker and I remember her telling me she made a new dinner for her husband every night! I was so impressed. I have always been more of the make one and eat left overs for a few days kinda girl. This was a family recipe they had been making for years and she gave it to me. Now, 9 years later I am still making this for my family with regular requests from my husband and kids. One of the best parts of this recipe is that it feeds a crowd. I can make it when the kids have friends or I need a dish to bring to a pot luck. I also often bring this when I am making a meal to deliver to a new mom or friend under the weather. It is comforting and familiar and allergy friendly so it is a pretty safe bet. When I took it to my friend who had a new baby last week she said even her 2 year old that doesn’t eat anything loved it! The original recipe calls for white rice and Ritz crackers, but I “health” it up just a bit by using brown rice and whole wheat Ritz crackers. I mean it is still comfort food but that way it is packed with whole grains! You can use either though with great success! On to the recipe…. you can see how anxious my 2 year old was to dig into this! I had to throw this in because those chubby little hands! I just want to gobble them up. You can read below to hear the recipe with all my thoughts and comments on how I make this dish where I answer frequently asked questions, or skip below to get to the more concise recipe card. 3 chicken breasts, cooked and shredded or cubed- I usually bake my chicken breast with a touch of olive oil, salt and pepper, but you could also boil, pressure cook, or use a rotisserie chicken (white & dark meat). Just go with whatever you feel most comfortable with! 2 small cans or 1 large can Campbells cream of chicken soup- You can use regular or the 98% fat free kind, both will work. I really think Campbell’s tastes better than other brands I have tried, so I recommend it! 2 cups Minute (or quick cooking) rice- You can use white or brown, either will work here. Do not cook the rice! It will cook to perfection in the casserole. 2 cups chicken broth- You can use store bought or make your own chicken broth which is pretty much free and packed with flavor. In a large bowl, mix cream of chicken soup, cubed chicken breast, rice, chicken broth and sour cream together until everything is incorporated, then spread the mixture into a 9×13 baking dish.At first it will look all soupy and kinda gross, but keep stirring because it will eventually all come together … just keep stirring! The end will still be thin-ish, but that is what we want since we need enough liquid in there for the rice to soak it up and get perfectly tender. Also, note that you can use low fat both on the cream of chicken soup and the sour cream if you want. 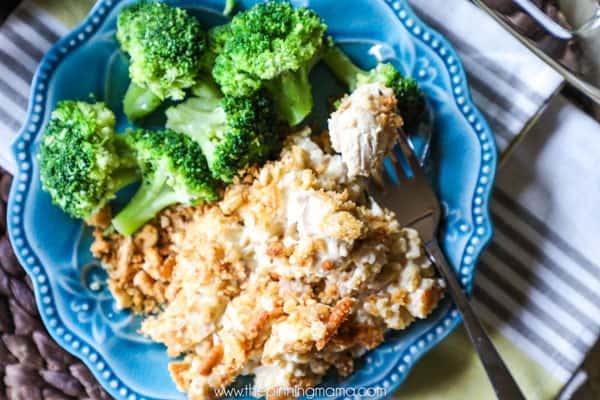 This is comfort food, and not really a “light” recipe, but if you are looking to cut a few calories, you can sub here without losing too much flavor.I usually serve this meal with broccoli as a side. I do at times though mix the broccoli or other veggies right in. If you want to skip the side, and bake it right in, then add the veggies in this step. I have used broccoli, peas, mixed veggies, and mushrooms and all of them turned out delicious. Just make sure they are thawed before adding or it can add quite a bit of time to the amount of cook time. In a medium bowl, melt the butter, then pour in the crushed crackers and stir until they are evenly coated in the butter.I put my crackers in a ziplock bag and roll over them with a rolling pin a few times. You can also let the kids stomp on the (make sure the bag is sealed well, and is a Ziploc not a cheap off brand if you do this method- personal experience) or use a meat pounder. I make sure they are broken up pretty well, but they don’t really have to be a fine crumb. Spread the cracker mixture over the top of the casserole, then place in the middle rack of the oven and bake for 40 minutes, or until the crackers are golden and the rice is tender.You should not have to cover this while it bakes. I do not cover mine and it always comes out perfect. With that said, each oven can cook slightly differently and the dish can be a different distance from the heating element, so if you look in and notice the crackers are getting more browned than you would like, then you can pop a piece of foil over it loosely towards the end until it is done. Serve hot. Enjoy friends! 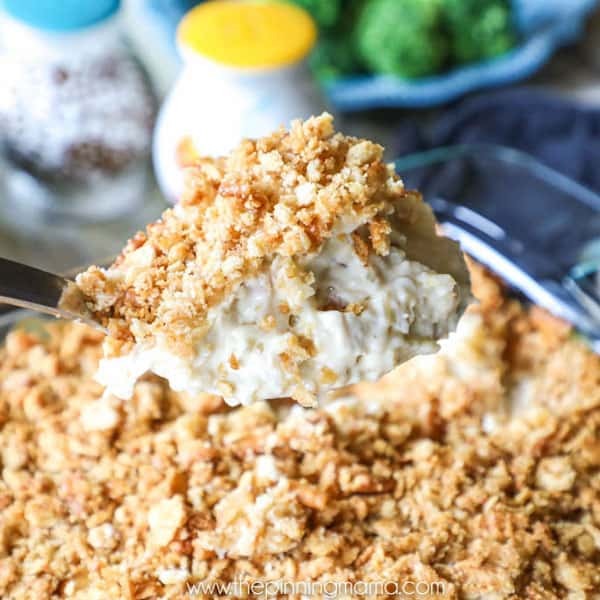 This is absolutely a creamy, dreamy comfort food and to compliment it serve it with a big side of your favorite veggies. I usually go with broccoli, but really any veggie works well with it. Also, this reheats beautifully! 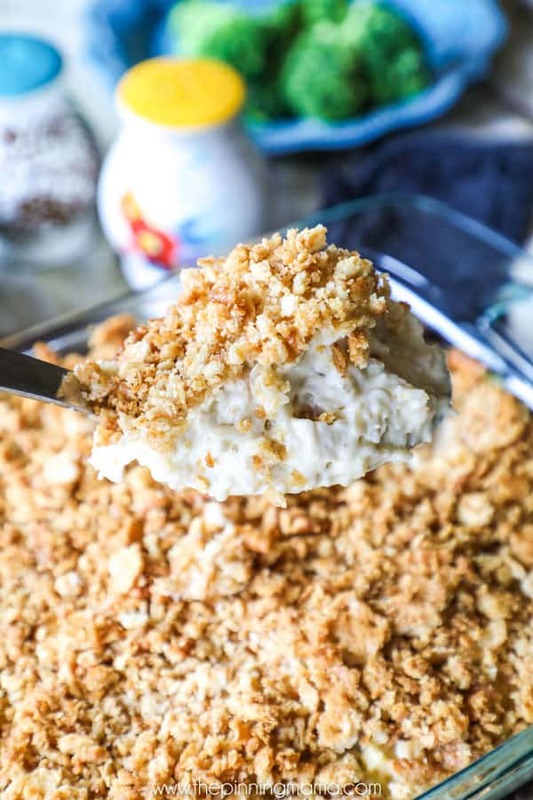 You do lose the crispy delciciousness of the cracker crust, but the casserole iteself just becomes more flavorful as it sits in the fridge waiting to be polished off. Our biggest problem is fighting over who gets the leftovers for lunch! 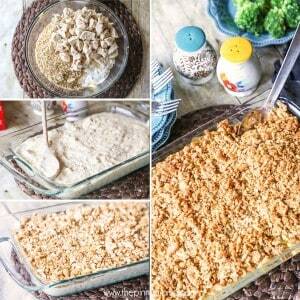 NOTE: This casserole can be cut in half and make in an 8×8 dish also! 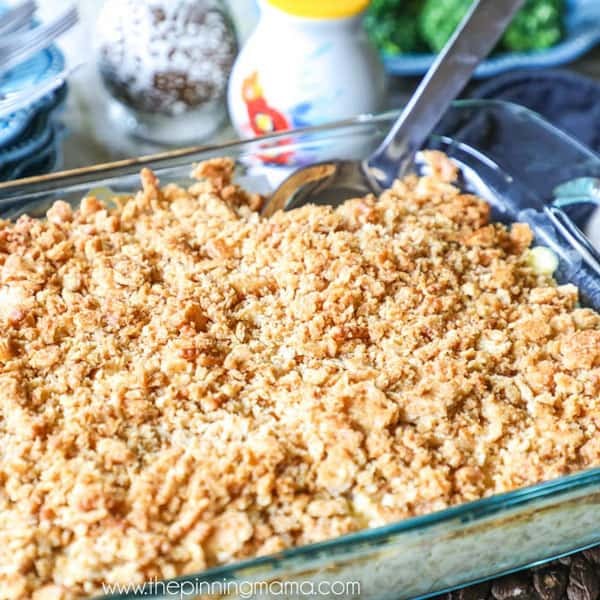 I really hope you love this recipe as much as our family has! A big thanks to Charlotte for sharing this with me so many years ago and letting me share it with you! If you make it, I would love, love, love to hear about it in the comments. It makes my day to know that someone made and enjoyed my recipe! Also, if you post a pic on Instagram, make sure to tag me so I can see @easyfamilyrecipes! In a large bowl, mix cream of chicken soup, cubed chicken breast, rice, chicken broth and sour cream together until everything is incorporated, then spread the mixture into a 9x13 baking dish. In a medium bowl, melt the butter, then pour in the crushed crackers and stir until they are evenly coated in the butter. Spread the cracker mixture over the top of the casserole, then place in the middle rack of the oven and bake for 40 minutes, or until the crackers are golden and the rice is tender. Made this yesterday to take over to a friend and her family. It was a hit! The kids all loved it. Made an extra pan for our family and it was SO delicious! This will be my go to recipe! So easy to put together! I just made this. I forgot to add the sour cream but my Dad said he doesn’t remember him and Mom putting sour cream in it. I hope it’s still good. My Mom used to make this and I haven’t had it since she passed away a few years ago. That’s awesome! So glad you enjoyed it. I love the idea of using veggies in lieu of meat. So yummy! How many ounces in a large can of cream of chicken soup? We only have one size in our area (10.5 ounces). Would I need 2? Can’t wait to make this! 22.6 oz. It isn’t exact but I just use 2 of the 10.5 if I don’t have the big one. Enjoy! If my calculations are correct and if you use about 2lbs chicken for the whole doubled recipe, this comes out to about 225 calories per serving (1/6 of an 8×8 tin). Not bad! All the substitutions really don’t make it taste disappointing at all! Cook for close to 2 hours from frozen, and really make sure that topping is brown and crispy! How many will this recipe feed ? Thank you in advance. I need to feed 12 people should I double? I don’t have minute rice, can I use regular rice? Should I precook it? How much how much regular rice? So excited to make this. You should be able to use regular rice (not cooked) but you may need to leave it in a few extra minutes to cook. I made this with left over roast checken using what i had, wild rice and cream of celery soup instead of cream of chicken. I didn’t have any Ritz crackers so I substituted Italian seasoned bread crumbs. I think the Ritz would have been better though. All in all, it came out creamy and delicious. Definitely will make it again. Can’t wait to try this. Sounds & Looks Yummy! Are you suppose to cover while baking? Can I use club crackers instead? It will have a slightly different flavor but i think it would still be good! All I have is regular rice-not quick cooking! Can I cook it first and put it in the casserole? bummed! I think it will work with regular rice, just adjust the broth to the ratio you need (if it is different than 1:1) and you may have to cook it a bit longer to get it cooked through. I would give it a try though for sure! I cooked the rice first and it came out perfect! If I cut all the ingredients by half do you think I should cut cook time in half? There is only 3 of us so don’t need a large pan. Could I use cubed uncooked chicken?what adjustments would I need to make? My family and I love this dish, it is delicious…Can’t go wrong with this one. My picky kids request this dish regularly! 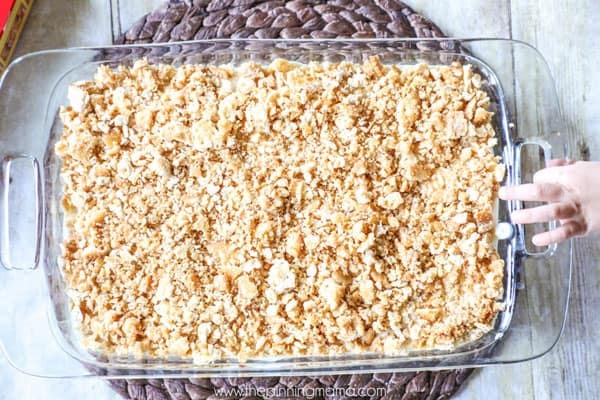 Question…can you prepare it up until the ritz cracker topping and then freeze? If so, do you fully thaw before baking? Yes! That is exactly what I do. I usually do it flat in a ziploc bag then thaw and put it in a casserole for baking. You can also make big batches and freeze them in smaller amounts if your family doesn’t eat the whole thing. SO I got the condensed soup. Do I add the water required or is that what the broth is for?? You do not need to add anything that isn’t listed. The broth will provide enough liquid for the dish! When you make this to take to someone, do you bake it first or just bring it uncooked and have them bake it when they want it? You can do either and I have done both of those and also brought it frozen. You can ask what they prefer or just go with what works best for you! Is it 2 cups of COOKED instant rice? (Like 2 bags of boil in bag, which equals 1 cup per bag cooked?) Or 2 cups dry instant rice? Thanks! 2 cups dry rice. It will absorb the liquid and cook right in the casserole as it is baking! I don’t know which part of the country you’re from that an oven can cook rice in 40 min at 350°. Perhaps you should specify that may only work with minute rice. I know Right !. Mine has been in oven at 350 Degree for 25 minutes and it hasn’t done anything. My 12 year old son made this today. It was fantastic! He grilled his chicken which tasted just fine. Sorry I didn’t care for the taste of this. Not a hit at our house. This really IS as wonderful as you described! As you, I was hesitant when I saw no seasonings, but just like you said it was so packed full of flavor it needed no additional seasoning! The second time I made it I did as you suggested and added mushrooms and some leftover broccoli which just added another level of flavor! I also took the liberty and added crushed French fried onions to the Ritz crackers and everyone loved it. 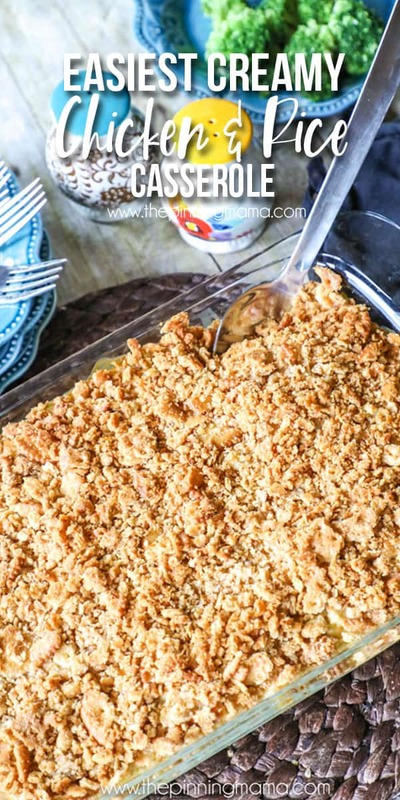 A truly easy, tasty recipe this grandma will add it to a list of FAVORITE busy day recipes for when the grandkids visit! Thank you for a quick, DELICIOUS recipe! Very delicious and simple recipe but definitely used minute or a quick cooking rice because I had to cook the food almost an extra 45 minutes to an hour just for the regular rice to get soaked while adding more water in the meantime. It made the Ritz crackers mushy which was my fault because I had nowhere else to put it but on the top! Hopefully leftovers tomorrow will be just perfect with fresh crackers. Super easy and yummy. We are gluten free so I topped With crushed corn Chex and butter. Awesome! how would one proceed with this recipe if they wanted to use cooked leftover rice?